Ad revenue in Europe grew 34% to £3.27bn, while in North America it rose 33% to $6.55bn. 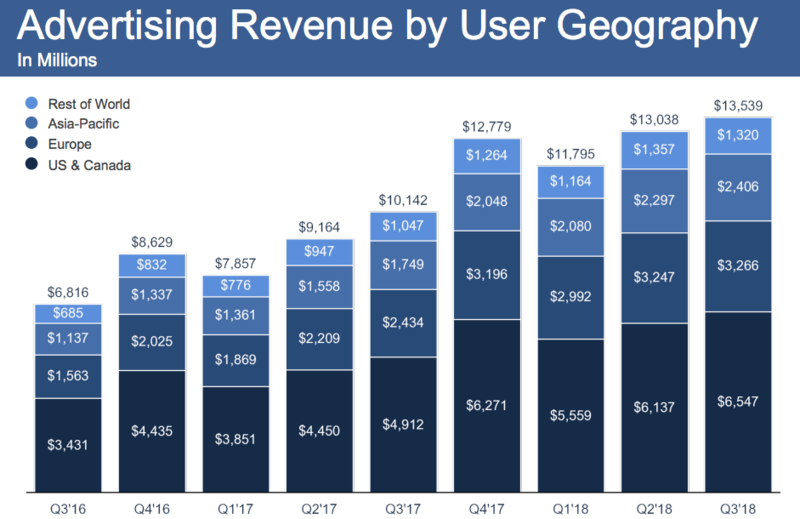 The Facebook juggernaut is continuing apace as revenues shot up by a third last quarter, despite founder Mark Zuckerberg admitting that usage may be close to saturation point in its most lucrative markets. Zuckerberg said in an earnings call that Facebook "may be close to saturated in developed" countries, but that the company was expanding its capability to deliver stories and video. Facebook is also prioritising "building communities" as opposed to the news feed, which has so far been a central feature of its platform. Its revenue, which is almost completely made up of ad revenue, was up a third year on year to $13.54bn (£10.63bn) for the three months to 30 September. European ad revenue growth was slightly above average compared with Facebook’s other markets (up 34% to $3.27bn), while its biggest market in North America grew 33% to $6.55bn. Mobile advertising makes up 92% of ad revenue in the third quarter, up from 88% compared with the same period last year. 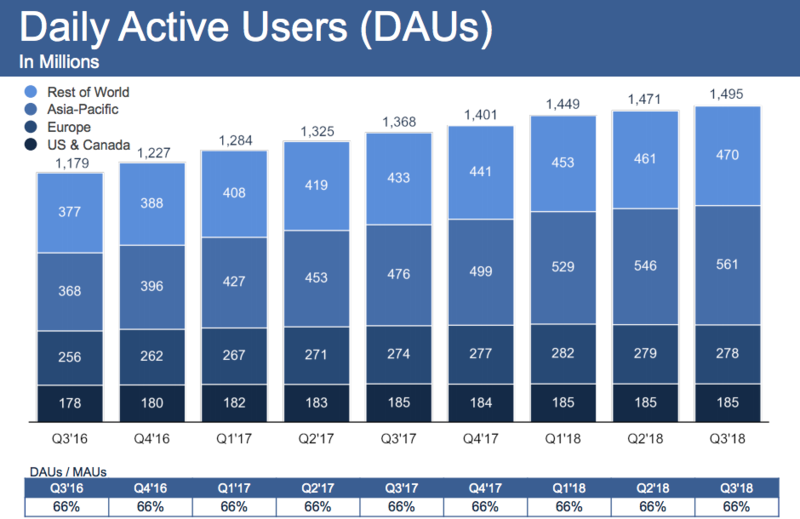 Daily active users, meanwhile, were 1.5 billion on average for September 2018, which Facebook reported as a 9% year-on-year increase. But this fell short of analyst estimates of between 1.51 billion and 2.29 billion. As predicted by Morgan Stanley earlier this month, Facebook lost a million daily active users in Europe, while user growth was flat in North America and up five million in Asia-Pacific. Facebook has also greatly ramped up its global staff numbers in the past year, with a 45% increase to 33,606 to the end of September. Shares in Facebook were up 4% after the company’s earnings call, with earnings per share of $1.76 surpassing Wall Street estimates. Debra Aho Williamson, principal analyst at eMarketer, described Facebook’s earnings as "decent" given the challenges it has faced this year. A data misuse scandal broke in April following whistleblower allegations to The Observer that detailed how Cambridge Analytica used Facebook’s data on behalf of political campaigns, including helping to elect US president Donald Trump. And at the end of September, up to 50 million accounts were compromised in a data breach that allowed hackers to log in to other accounts that use the social media company's system. 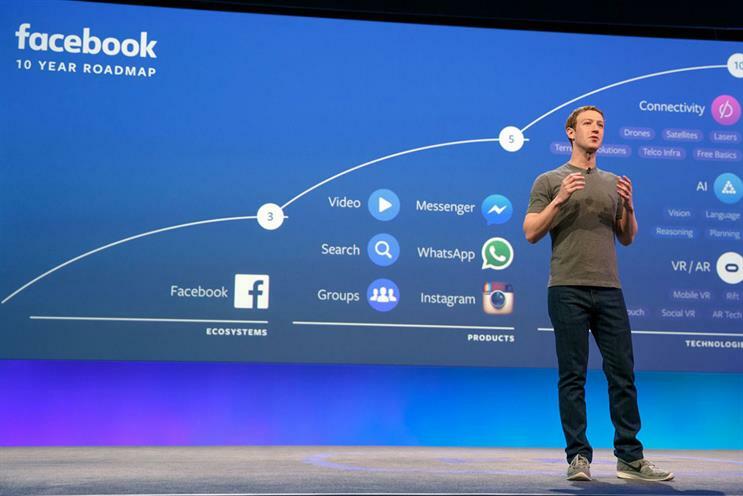 Zuckerberg said in a statement: "Our community and business continue to grow quickly and now more than two billion people use at least one of our services every day. "We’re building the best services for private messaging and stories, and there are huge opportunities ahead in video and commerce as well."